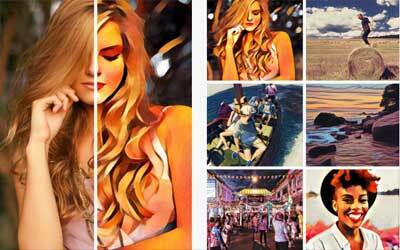 Prisma – Art Photo Editor APK 1.1 release is one of the most complete images converters for android. Everyone can be a photographer nowadays even without having certain skill and sophisticated camera. You can be a photographer by only having android device. Moreover, there are so many applications to support this hobby. That is Prisma, an application which will make your images look more wonderful and outstanding. Basically, this application will convert certain images from your gallery into artistic painting or art works. In addition, you are also able to use iPad, iPod, and iPhone beside android phones. In short, this application is such a picture or photo editor that utilizes art filters to create image with painting outlook. Converting your images into something different will add their uniqueness. It will tell a story, not just performing a picture. Alexei Moiseyenkov, a person who invented this application along with his Prima Labs. This application works by using art filters to draw painting from your actual pictures. The result will be as real as possible. Prisma is very different from similar applications where they commonly add layer over the image to create painting outlook. There are so many modern art filters to be used such as Van Gogh, Gothic, Candy, Roland, and many more. In addition, there will be a video converter to be one of the best features in this application. If it is released, you will have a power to convert your video into animation or art video. This application offers tons of easiness to create art work directly from your gadget. You will not need any additional photo editor once applying this app. You can get the latest update of this application in Google Play Store. This latest update is officially launched on July 5, 2016. You have to ensure that your android uses android 4.1 or higher to apply this application.